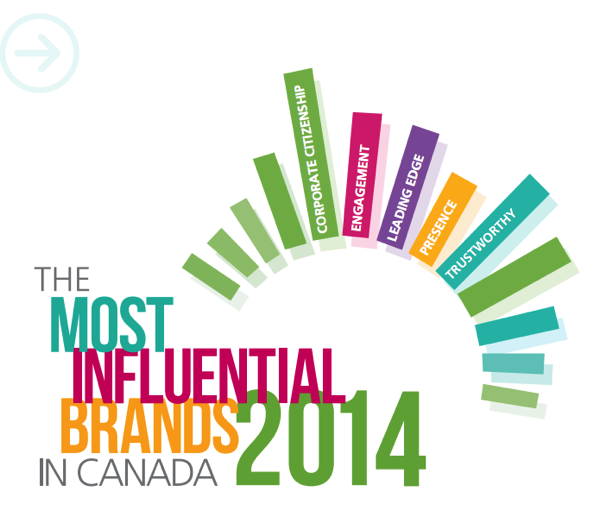 Apple secured a place among the top four most influential brands in Canada for 2014, according to a report compiled by Ipsos Reid in partnership with the Institute of Communication Agencies (ICA). The top spot, however, in last year’s “Top 10 Most Influential Brands in Canada” goes to Google for the third time in a row, Steve Levy, Chief Operating Officer at Ipsos Reid in Canada, revealed at day two of FFWD: Advertising & Marketing Week 2015 in Toronto (via the Globe and Mail). The results are based on Ipsos Reid’s fourth annual Most Influential Brands study examining five key dimensions that define the most influential brands in Canada, including Corporate Citizenship, Engagement, Leading Edge, Presence, and Trustworthiness. As you can see, brands in the top 10 are coming from the tech, digital, and social media sectors. Maybe this isn’t a surprise, but millennials are betting on tech and social brands, with Google, YouTube, Facebook, Apple, and Microsoft topping their list. However, there are three new brands “on fire” — Twitter, Netflix, and LG — which also rank high among the always-connected tech-savvy generation. By comparison, Gen Xers and boomers rate Microsoft as more influential than their younger counterparts.